What day is it? Oh, it's Thursday? Thank the lord!! How has your week been? I should probably pour us some wine. I feel like I have been running a million miles a minute. My real job is well, taking a lot of work. The contractor for one of my projects has my personal cellphone number... which I really regret sharing now. But what has really been keeping me up at night is preparing for my very first craft fair this weekend! In case you didn't know, I also have a teeny tiny Etsy shop where I sell cute cards, illustrations, wrapping paper, and all sorts of hand-lettered things! If you live in the Bay Area or want to impulse buy a plane ticket to San Francisco this weekend, I will be setting up shop at the Urban Air Market in Hayes Valley. Please come and buy all my things! I signed up early for my booth spot and I'm right in between Smitten Ice Cream and Biergarten. Good spot right? Reuben is tasked with delivering ice cream and soft pretzels to me so I don't pass out or cry if no one buys anything. Please stop by and say Hi! I'll stop begging now. In preparation for the craft fair I have been forcing Reuben to build me things, photoshopping new products, printing a billion cards, folding lots of paper, and baking bread! 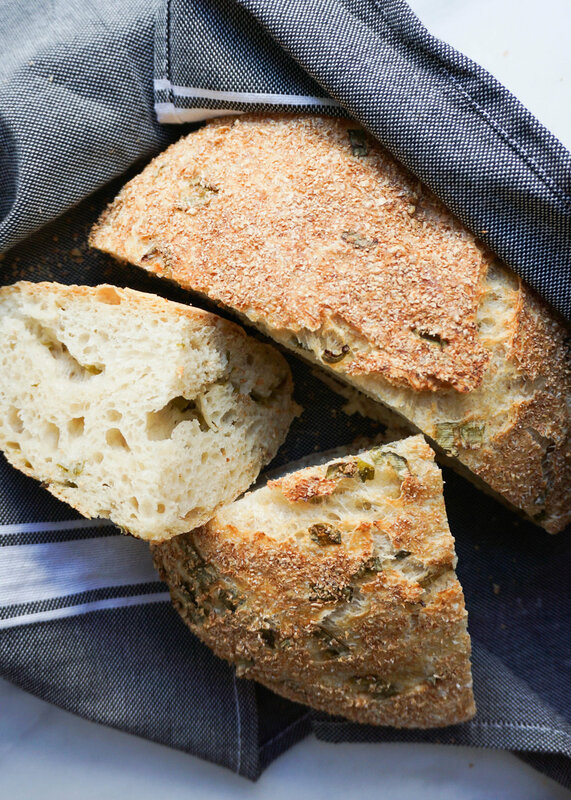 No knead bread is so freaking easy. I really can't believe it has taken me 26 years to realize the magical joys of baking bread. 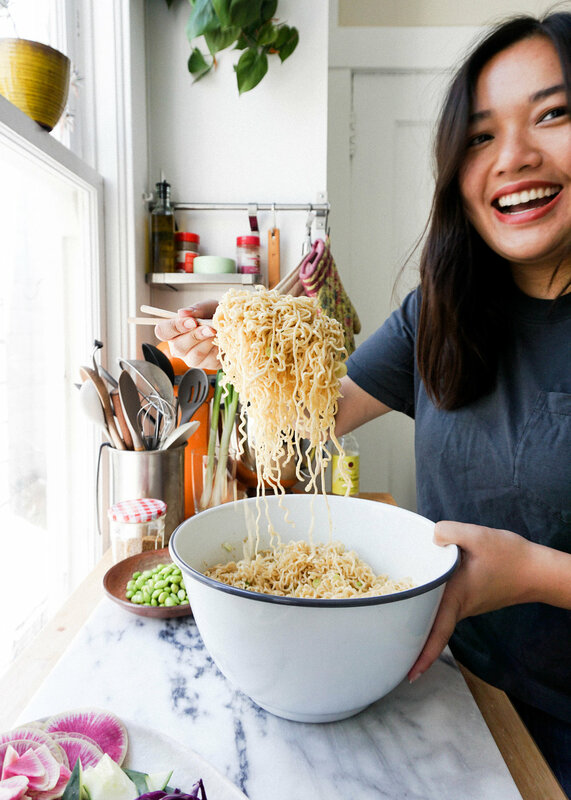 This recipe is the perfect thing to make if you want to put in minimal effort and get a great return. You give everything a quick mix and then cover it up for 18 hours. You can get so much done in 18 hours! Or not so much if you're having one of those days where you just want to sleep a lot. Sleep, watch Netflix, climb a mountain, call your mom, build a craft fair booth. These are all great things to do while your dough proofs. You'll be rewarded with beautiful, crusty, moist, and fluffy bread that will forever change your life and make you consider your career path. I put green onions in it obviously, because they make everything better. This bread is amazing for avocado toast, dipping in soup, slathering with butter, or just eating straight up still warm from the oven. My next project is growing a sourdough starter, which is bringing up the anxiety I had when I had a tamagotchi. 1. In a large bowl combine flours, yeast, and salt. Slowly add warm water and stir until you have a sticky and shaggy dough. Cover the dough with plastic wrap or a kitchen towel and let sit out at room temperature for 18 hours. Ideal room temperature is 70 degrees, if it's a little cold out put the bowl in your oven with the door left ajar. 2. After 18 hours your dough should have expanded and look like it is full of bubbles. Lightly flour your work surface and scrape out your dough. Dust it with some flour and gently pat it into a circle. Sprinkle some green onions into the center and fold dough over. Pat into a circle again and repeat adding green onions until fully mixed. Form dough into a round ball. Cover loosely with plastic wrap and let sit for 15 minutes. 3. 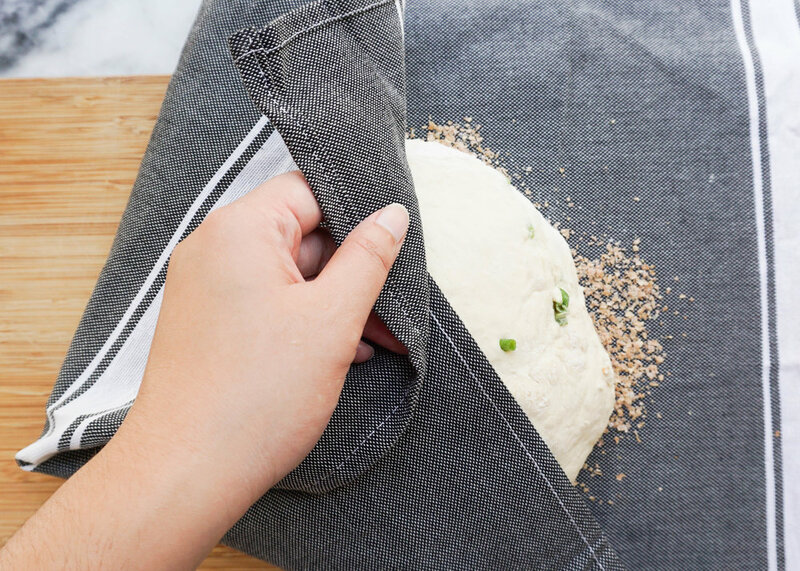 Cover a cutting board with a clean kitchen towel and lightly dust towel with some wheat bran or more flour. 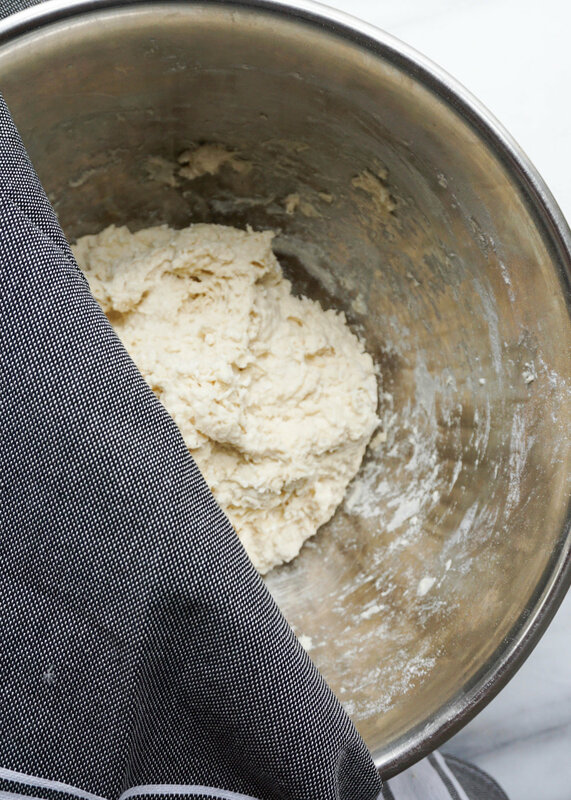 Gently transfer dough onto the towel and dust again with some more wheat bran or flour. Cover the dough with the corners of the towel and let dough sit for a final 2 hours. 4. 30 minutes before the 2 hour proof is up. Preheat your oven to 450 degree with your Dutch Oven inside. Once preheated, safely remove hot Dutch Oven and remove the lid. Unwrap the dough and place a firm hand underneath the towel/dough. Carefully flip the dough into the Dutch Oven. You gotta commit! If the dough is slightly off centered, just push it around a little with a spoon, but it doesn't need to be perfect. 5. Cover with lid and bake in the oven for 30 minutes. Remove the lid and bake for another 15-20 minutes until golden brown and crusty. 6. Remove form oven and allow to cool on cooling rack. Cut a slice and enjoy! recipe was based on the New York Times recipe! Give yourself a high five. Buy that almond croissant to go with your coffee. Extend your lunch break by 15 glorious minutes. You deserve it. You have successfully made it to Thursday and the weekend is only a couple desk hours away! You're going to make it! I'm sure 99.9% of you share this sentiment: I LIVE for the weekends. The weekends are when I get to feel human again. I paint and draw while the sun is shining. I test and photograph recipes, also while the sun is shining. Most importantly, I get to make a decent breakfast in peace. Throughout the work week my mornings are hectic because 99.9% of the time I am running late to work, I'm squished into a bus that's going about a block a minute, my hair is still wet, and when I get to my desk I'm either having a granola bar or an instant oatmeal packet for breakfast. I know that this is easily preventable if I just wake up earlier... but who does that? Anyways, I'm not a fan of a sad desk breakfast. Breakfast is really important to me. Sometimes I have a second breakfast, that's how much I love it. It's my favorite meal because it is really the only composed meal that you can have sweet and savory share a plate (I don't know, does a slice of pizza with a piece of chocolate cake sound good together? Kinda........). Cooking is my therapy, so preparing a thoughtful and peaceful breakfast also puts me into a really great mindset for the rest of the day. To get my mental state right, I've started a routine of going to the Clement Street Farmer's Market every Sunday morning. I put on pants, walk a few blocks, try all the fruit samples (THE ORANGES ARE INSANE RIGHT NOW), contemplate if I should buy the cheese danish from the bread stand, creep on the babies and puppies everywhere, and pick up some produce for the following week. Then I head back to our apartment to make a simple but filling breakfast for Reuben and I. We inhale our breakfast, then he studies or watches sports and I paint and write silly puns. We might take a break in the middle to walk and get some coffee. Then it's dinner time and we watch Worst Cooks in America. That's our Sunday! This past Sunday, our breakfast was Honey Ricotta Toast on Levain (is Levain just the French word for Sourdough? Can someone explain the difference? ), slices of beautiful Cara Cara and Blood Oranges, and a fried egg. It's simple, pretty, and only takes about 10 minutes to whip up. Give it a try! This upcoming weekend is not going to be quite as peaceful. We are hosting Superbowl Sunday (I'm making another football field cake!) AND I'll be baking up a storm for the first Babes Brunch of 2017! Wish me luck. I'm probably going to be covered in flour. What are your plans for the weekend?? Don't forget to make breakfast! Melt your butter in a skillet on medium heat. Place slices of bread in the skillet and let bread soak up the butter on one side for a seconds. Flip over and let the other side of the bread toast for 3-4 minutes or until golden brown. Repeat with other side. Place your toast on plates or a cutting board. Smear however much ricotta you like on the toast with a knife. Drizzle honey over your toasts and sprinkle a pinch of sea salt on on each one. Pair with some fruit, salty meat, or eggs and enjoy!